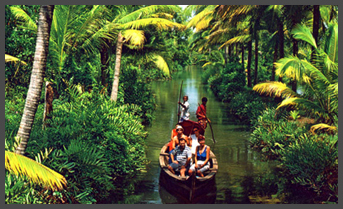 Sea trade started with the Phoenicians, and in 1000 BC Kerala was visited by King Solomon's ship that travelled to 'Ophir', in all probability the modern Puvar, south of Trivandrum. Then followed the traders from Greece, Rome, Arabia, China, Portuguese who gained right in 1516; the Dutch merchants a stronghold in 1602, and by 1663 the Portuguese were forced out of the area. By 1795, however, the Dutch too had to move out, for the British traders had become the strongest power in India by that time. Much earlier, the Jews came to Kerala when they fled the rule of Nebuchadnezzar in 587 BC; St. Thomas the Apostle came here in the first century AD; Kathakkali Dancerthe Syrian Christian were in existence here in the 2nd century AD. When the Portuguese came to Kerala, they found a thriving Christian community here, but one that had never heard of Pope.